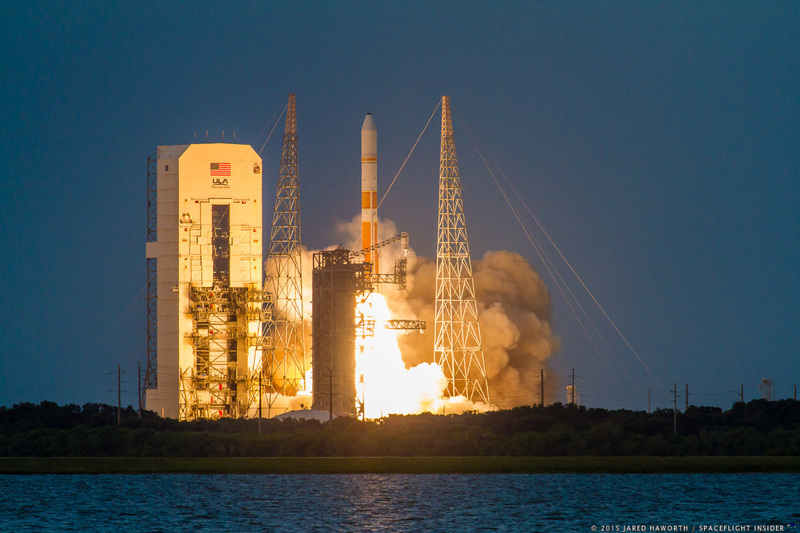 CAPE CANAVERAL, Fla. — Lifting off at the very opening of its launch window, a United Launch Alliance (ULA) Delta IV Medium+ (5,4) rocket delivered its precious cargo of the seventh Wideband Global SATCOM spacecraft to orbit. The mission got underway with a successful launch at 8:07 p.m. EDT (00:07 GMT). With the Sun already beginning to dip below the horizon, the Aerojet Rocketdyne RS-68A and four Orbital ATK GEM-60 solid rocket boosters (SRBs) created a new dawn as they pushed the launch vehicle out of Earth’s atmosphere and into the black of space. According to a report appearing on SpaceFlight Now, the WGS-7 spacecraft cost an estimated $566 million and will be used by members of the U.S., Australian, and Canadian armed services as part of a combined system that is being fielded to enhance services provided by current systems already on orbit. The Delta IV Medium that flew this evening was different than some of the prior versions of the rocket that have ferried other WGS satellites aloft. The rocket’s Common Booster Core (CBC) utilized an improved version of the Aerojet Rocketdyne RS-68A rocket engine, capable of increased thrust and improved combustion efficiency. 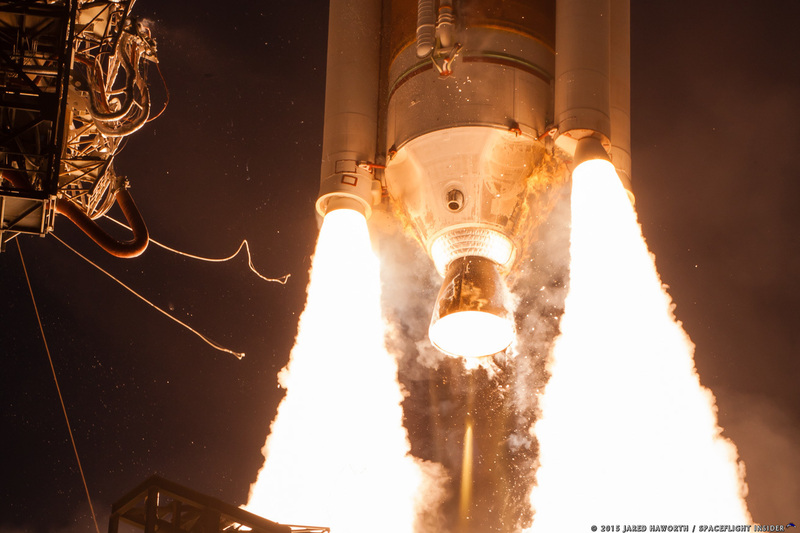 Three of these rocket engines that was employed tonight – first flew during the June 29, 2012, flight of a Delta IV Heavy rocket (owing to the triple-bodied design of the launch vehicle) with the classified NROL-15 mission. The RS-68A engine, fueled by a combination of liquid oxygen and liquid hydrogen, has the capability of delivering more than 700,000 lbf (3.1 MN) of thrust. “The seamless integration of our propulsion systems, from launch to orbit insertion, culminated in another successful launch,” said Steve Bouley, vice president of Space Launch Systems at Aerojet Rocketdyne. ULA had about 39 minutes in the launch window in which to get the rocket and its payload off of the pad at Cape Canaveral Air Force Station’s Space Launch Complex 37B (SLC-37B) and into the skies. Weather predictions estimated that conditions at the launch site would provide about a 60 percent chance of favorable conditions for launch. This was in stark contrast to the weather of the prior day with storms cropping up around noon, with high winds causing efforts to launch the rocket and spacecraft scrubbed early in the day. Built by Boeing, the WGS-7 satellite on this flight is part of a constellation of high-capacity communications satellites. It is hoped that these spacecraft will render their services for the next decade – or longer. The WGS constellation will work to reinforce the capabilities of the UHF follow-on satellites already on orbit. ULA completed the Launch Readiness Review (LRR) two days prior to this evening’s flight, clearing the way for flight. Tonight’s launch was typical of normal Delta IV flights, with increasing levels of activity starting some eight hours prior to flight. The Mobile Service Structure (MST), a massive building that encompasses both the booster and its payload prior to launch, was rolled back earlier today. When this was done, the recognizable orange and white launch vehicle was revealed, ready for flight. The MST was moved back approximately 360 feet (110 meters) in preparation for this evening’s events. Approximately five-and-a-half hours prior to liftoff, personnel at SLC-37 were evacuated in preparation for flight. A little more than four hours prior to launch, the cryogenic liquid oxygen (LOX) and liquid hydrogen (LH2) tank chill-down commenced, followed 20 minutes later by the slow fill of LH2 – which moved to fast fill ten minutes later. Common Booster Core LOX loading began with slow-fill some three hours and thirty-five minutes prior to the scheduled liftoff time; this moved to fast-fill about five minutes later. Loading and topping of the Delta Cryogenic Second Stage (DCSS) took place over the course of about an hour and twenty minutes, starting at two hours and thirty minutes prior to launch. 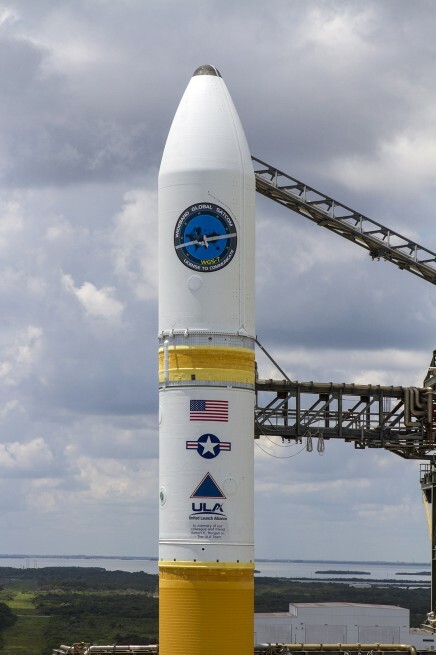 ULA conducted an array of checks and briefings before carrying out a Go / No Go poll at about seven minutes prior to the opening of the launch window. With these final milestones complete, the stage was set for this evening’s launch. Just twenty-five seconds prior to liftoff, the call of “Green Board!” was given – meaning that everything was cleared in preparation for the flight. At about ten seconds before launch, the Terminal Countdown Sequencer was now in charge of the launch. At T-minus zero, a bright light, followed by a plume of rapidly-accelerating smoke, could be seen – even at a distance of about two miles. 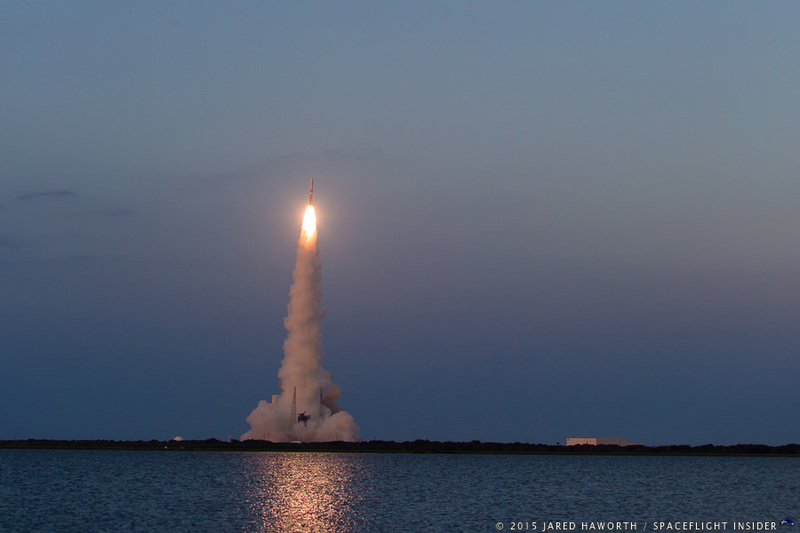 Next, the unmistakable roar produced by the RS-68A and four GEM-60 SRBs ensued, and then the Delta IV Medium flew off of the SLC-37 launch pad and into the dimming skies above. 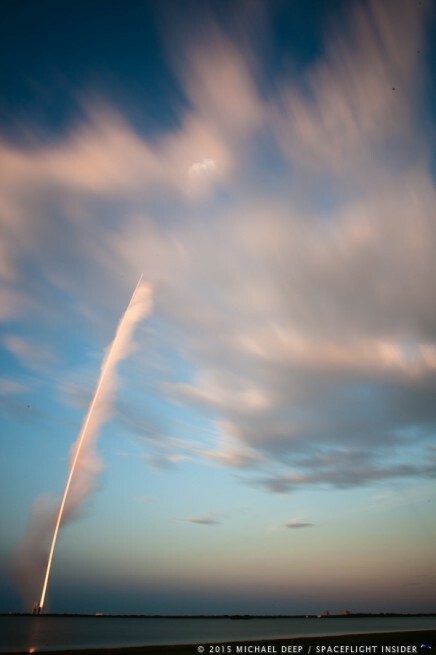 The light generated from these rockets cast a glow similar to a blowtorch with their iconic crackling roar – slamming its waves down to those watching far below. About forty-six seconds after launch, the rocket approached the threshold known as maximum dynamic pressure or, more commonly, as “max-Q” – the point at which aerodynamic stress due to rapid air flow and pressure on a vehicle in atmospheric flight is maximized. A minute and a half into the flight, their part in the mission complete, the GEM 60s detached from the CBC and fell back toward the Atlantic Ocean far below. Shortly thereafter, having completed their role in shielding WGS-7 out of Earth’s atmosphere now complete, the two parts of the Payload Fairing separated revealing the spacecraft. Jettisoned, these two components of the five-meter PLF followed the GEM-60s, falling back to Earth. Boeing issued a release shortly after the satellite had reached orbit stating that WGS-7 had successfully sent signals back to mission managers back on the ground. According to Boeing, WGS-7 is expected to provide an estimated 17 percent more secure communications bandwidth to users.